An out-of-state logistics company is contemplating building a warehouse/distribution facility in southwest Allen County, according to an application scheduled for consideration Thursday by Allen County Council. XPO Logistics Worldwide is eyeing 24 acres of county-owned land at 13201 Bluffton Road on the north side of McFadden Way, just north of the 1.5 million-square-foot General Mills distribution center. 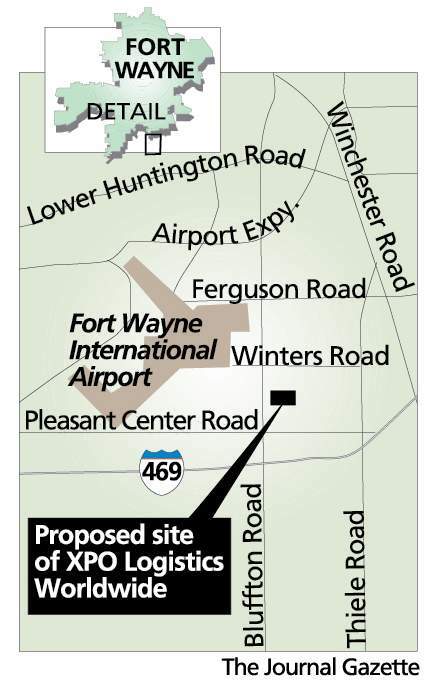 XPO, based in Connecticut but running the project from Concord, North Carolina, would invest $26.3 million in the site, now in the hands of the Allen County Redevelopment Commission. Promising to add 75 new jobs with an annual payroll of $3.46 million, XPO is seeking a 10-year tax abatement, which is a phase-in over 10 years of the real estate and personal property taxes owed to the county. The abatement would save the company about $2 million in taxes during that time, the application states. Few details about the use of the facility were provided by the company in the application – except the site would "facilitate a customer agreement in its (XPO’s) health-care vertical" and the facility could be "expandable." However, the application states the site is not the only one in the running. In addition to an unnamed number of Indiana sites, locations in southern and southeast Michigan "have been closely considered." The "key drivers" of the ultimate site selection are "land availability, construction costs, customer base and business environment," according to the proposal. Project managers Monday did not return calls seeking details on XPO’s plans. The company website outlines a company global in scope, with 1,469 locations in 32 countries and a projected $15 billion in annual revenues. XPO has about 84,000 employees worldwide and is considered a Top 10 company in its field, which includes transportation, truck brokerage, less-than-a-load, intermodal, last-mile and other truck transportation services. According to a Dec. 7 shareholders presentation, XPO in late October purchased Con-way Inc., the third-largest trucking and shipping company in the United States and headquartered in Ann Arbor, Michigan, and its subsidiary, Menlo Logistics for $3 billion. XPO since has cut about 10 percent of Con-way jobs there and at another site in Oregon, mostly in upper and middle management, according to an article at dcvelocity.com, a truck industry website. The Allen County site’s application proposes 21 management jobs with an annual salary of $102,000 and 54 production jobs with an average salary of $38,000. The new building is proposed to cost $18 million with the rest of the improvements in equipment, the application says. Con-way is the second $3 billion or more acquisitions in the last year, with XPO going from a company that didn’t exist in 2010 to one that has had finished 17 acquisitions, according to dcvelocity.com. Now the task is integrating those operations, the website states, citing XPO President Brad Jacobs. "One of the main reasons we bought Con-way is that we see a concrete opportunity to increase annual operating profit from the acquired operations by $170 million to $210 million. We’ll do this through cost savings and operational improvements executed over the next two years, with initial benefits in the first 12 months," according to the Dec. 7 presentation to shareholders. Construction of the building is proposed to start by the end of the month and finish by the third quarter of next year. The rest of the investment would come in at $7.13 million in warehousing and about $1.2 million in information technology equipment. Installation is not expected to be completed until 2019, according to the application. The site has been owned by the redevelopment commission since 2011 and is one of three shovel-ready sites in the county, sites in which the county invested in infrastructure to speed development. The redevelopment commission also owns about 80 acres just south of the General Mills warehouse and the proposed XPO facility.